Eating Disorders start with a young person (usually a female)having a very poor self image. If just one person thinks she or he has to much fat on their bodies these individuals internalize the remark and focus only on their bodies. 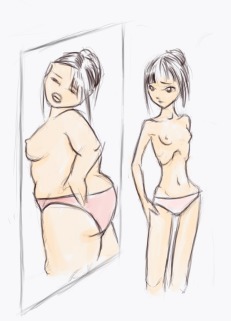 The anorexic person becomes obsessed with the notion that she or he is fat. Common disorders include anorexia nervosa, bulimia, and binge-eating disorder. On the flip side are those individuals who cannot stop eating. At some point in time the need to gorge oneself with food becomes the persons main focus. Nothing else seem to matter. These people become morbidly obese. Categorically the term for those who "live to eat" is binge eating where a person eats way beyond what he or she need for survival and healthy living. They just can't stop eating!! These individuals have lost control of their eating. The binge-eater is more often than not overweight to the point of being obese. Psychologically the binge-eater is suffering from shame, guilt and self-hatred which just keeps the cycle of this form of eating disorder going. Because of their eating disorder the binge-eater is at risk of heart disease, diabetes and a host of other life threatening illnesses. All of these diseases and disorders are a bi-product of obesity. You cannot persist in abusing your body with massive amounts of food and not suffer. 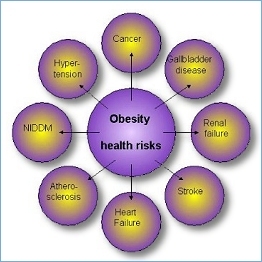 Obesity and related illness count for over 50% of medical costs today!! Find a clinic in you area and begin to take the controls back...and live healthy! Bulimia nervosa is categorized by recurring and frequent incidents of eating huge amounts of food. The person is feeling a mighty lack of control over the eating. The purging of food can be as often as once a week to several times a day. Because these individuals are ashamed and feel much remorse and guilt the bulimic behavior is often undetected by other. The bulimic person often has no weight issues either to thin or obese so this disease many times is not discovered until the bulimic person becomes badly ill.